The quest to find Scotland’s fans’ Player of the Year has been launched by the Scottish Football Supporters Association (SFSA), Scotland’s first independent national football supporters’ organisation. The awards, which recognised Celtic and Scotland star Kieran Tierney as the fans’ Player of the Year in 2017, will recognise the best and worst in the beautiful game in 2018. For the first time it will also ask the fans to vote on the best female Scottish player and the best manager in 2018. Other award winners in 2017 included ‘Goal of the Year’ for Leigh Griffiths’ second goal against England at Hampden; Steven McLean as Scotland’s ‘Best Ref’ ; Aberdeen fans as the country’s top travelling fans and Hearts’ Tynecastle stadium the ground most away fans like to visit. The SFSA, which has over 71,000 members across Scotland, has also announced a partnership with GambleAware, the leading charity in the UK committed to reducing gambling-related harms, which will see it as the awards’ partner. 20th July 2017 saw the launch of the Scottish Football Benchmarking and Evaluation 2017 survey, giving fans a voice that cannot be ignored any longer. Take the survey here. To coincide with the survey’s launch, we have produced a special video available on YouTube. Don’t miss your opportunity to tell us what you think is important. Using this survey, the SFSA will have a blueprint going forward which helps us address the issues that matter to fans. 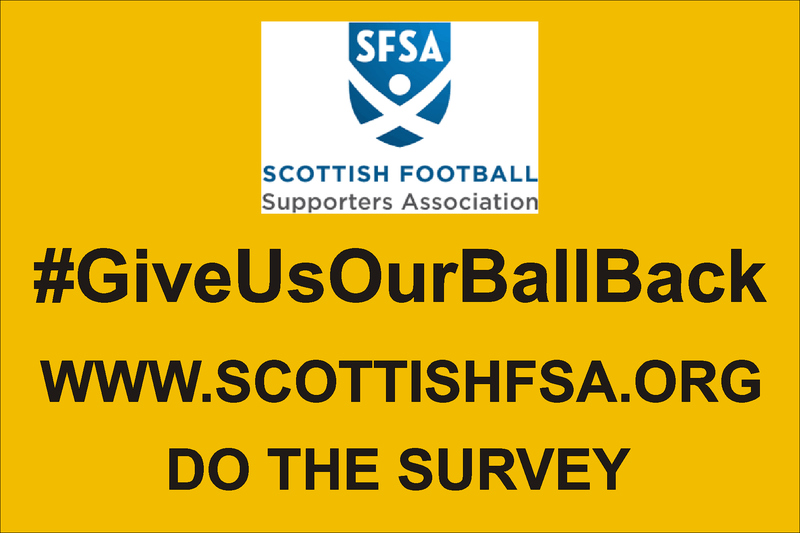 Please share the survey with your football supporting friends and family. The bigger the response, the bigger the voice! Remember, if you want to get involved in our movement please get in touch. We have also launched a JustGiving crowdfunding effort too to help ensure our long term sustainability. Help us to spread the word and grow our supporters. With more people like you behind us, we will have a louder voice. Together we can make a difference to key issues in Scottish Football. We thank all of our supporters for their continued support!